When it comes to sprinting, your speed is largely determined by your technique. Other factors include your leg length, pelvis width, lean muscle mass and lung capacity. There are few biological factors that you can improve in a week and some are down to genetics, but you can work on your technique, such as your posture and foot strike. Whether you are sprinting for athletics or to improve your performance in other sports, changing your technique can help you reach your full potential. Avoid shrugging your shoulders and keep your head still. Shoulder shrugging will lock your hips while head bobbing or twisting breaks proper form. Keep your shoulders, neck and jaw relaxed while you sprint. Swing your arms the opposite direction to your legs. You balance your leg motion by moving your arms in the opposite direction. Keep your elbows at a 65- to 90-degree angle throughout the sprint. Avoid swinging your arms across your body, pump them forward. Certified track coach Raymond Tucker recommends you swing your arms backward and forward at a 135-degree angle. Keep your hands relaxed and your fingers open -- a clenched fist disrupts your arm motion. Maintain an upright posture while sprinting and lean forward slightly. A forward tilt may seem like it will help you move faster, but it reduces your range of motion at the hip and may cause muscle strains in your hamstrings. 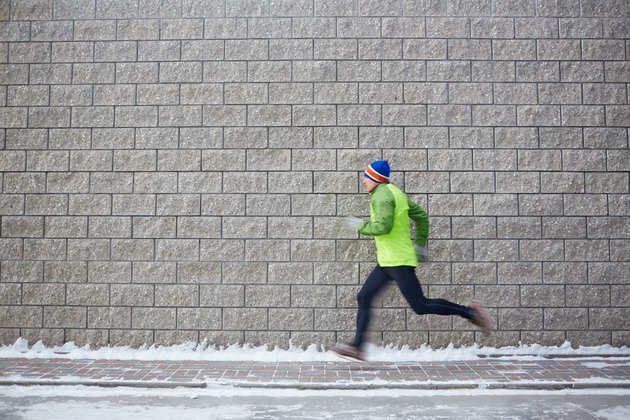 Increase your stride frequency with shorter strides. With a low stride frequency, your feet are in the air longer, which doesn't help you move quicker. The more strides you take, the more you push yourself forward, which boosts your overall speed. Push off and land on the balls of your feet. Olympic gold medalist Usain Bolt lands and pushes off the balls of his feet. When sprinting, you want to contact the ground briefly and quickly resume propelling forward. Heel strikes roll your feet from the heel to the balls of your feet then off your toes. This is ideal for walking, but it keeps your foot on the ground too long for sprinting. Another option is toe striking, which keeps you moving fast but may cause calf injuries or discomfort. To increase your speed in the long-term, Human Kinetics recommends you sprint at least twice a week and time it. Perform compound exercises such as parallel squats, straight-leg deadlifts and power cleans three times a week on non-consecutive days.